Ellie, our employee of the month for November, is, as you can see, every inch an Arabian mare. 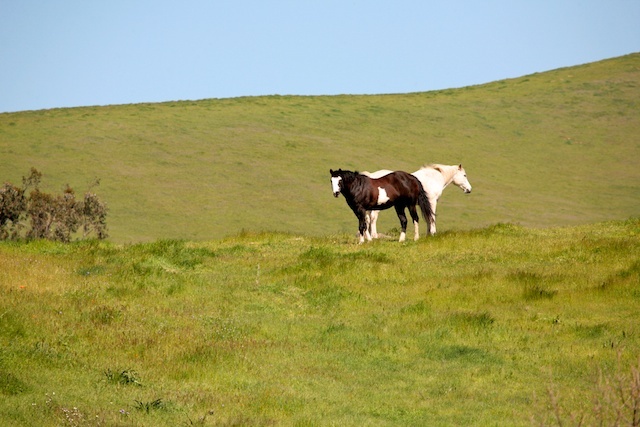 We’ve sung this breed’s praises before−tough, smart, oh-so-pretty−and looking at Ellie on the trails at Jack London State Historic Park brings back warm feelings about many great gray Arabian horses we have known and loved. There are, of course, half-Arabs Smoke and Nevada, still going strong, along with gorgeous purebred Max (see previous employee of the month write-ups). 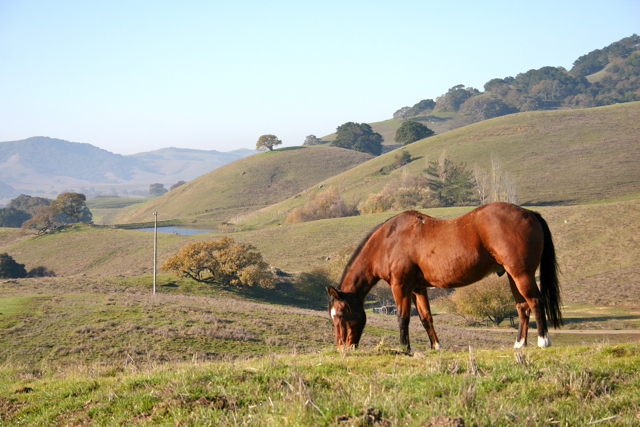 But we also remember Shahri, Rubio, Blue, Austin, *Elkana, Señor (going way back to childhood here), and maybe best of all: the magnificent Hooligan, a trail horse at Jack London Park in the 1990s for Sonoma Cattle Company. 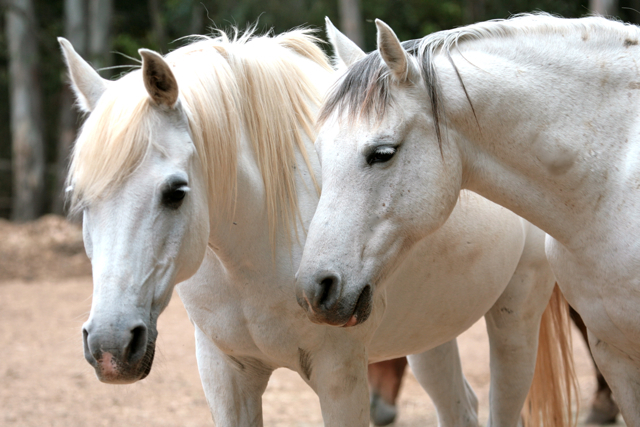 It may be possible to have a string of good riding and trail horses that doesn’t include at least one gray Arabian, but we’d never want to test such a crazy theory. 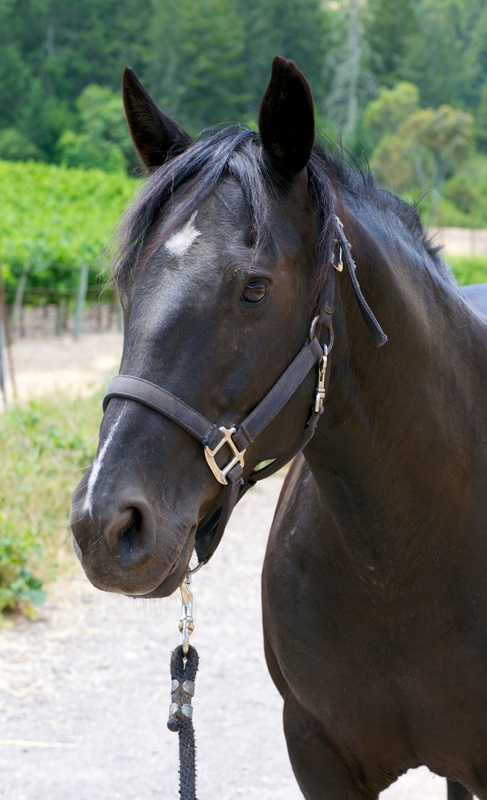 Well-named Olive, Triple Creek’s Employee of the Month for July, is black, round, piquant (we had to look it up–it means “pleasantly stimulating”) and an altogether tasty treat of a riding horse. A Welsh pony cross who seems very popular with her co-workers (Annie appears especially fond of her), Olive is learning the ropes on the trails (so to speak) and we look forward to great things from her and many pleasantly stimulating hours viewing Jack London State Park from her sturdy round back. 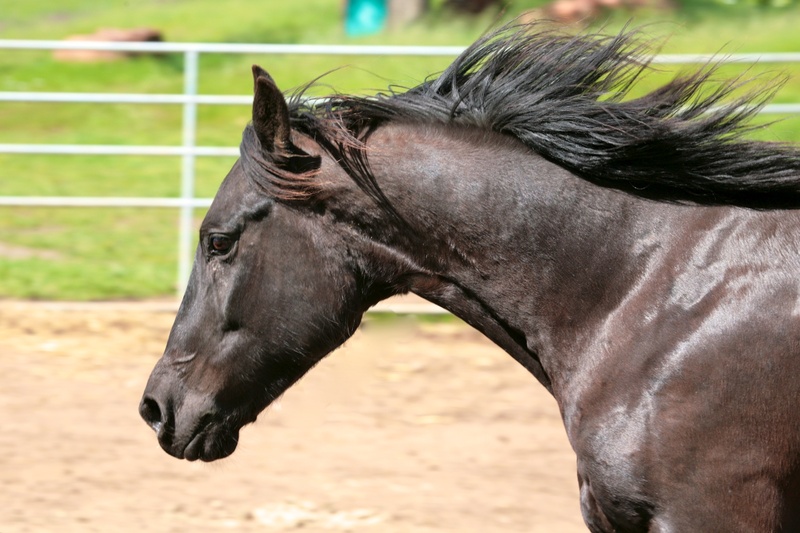 Horses, as prey animals, don’t spend a lot of time sleeping, and when they do they are generally on their feet. The racehorse Seabiscuit famously liked to take a load off and sleep long and soundly while lying down, which is another thing he has in common with Triple Creek’s Employee of the Month for June, Pluto. Also, they are both horses. 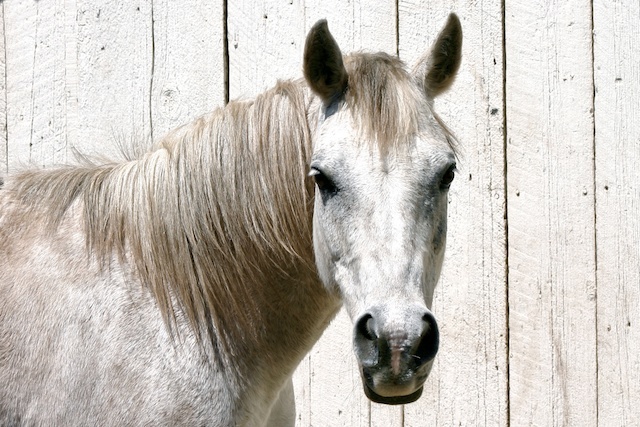 Pluto, a large, gentle palomino pinto, generally goes his own way in many things; he is a constant source of amusement and joy and we’re glad he’s rested up for the summer season. An agile, athletic and oh-so-Hollywood brown-and-white pinto, many people who see Mr. Smith, Triple Creek’s Employee of the Month for May, ask if they can ride “that one.” Alas, Smith (he won’t tell us his first name) has not yet realized that it can be fun to go on a ride even if you’re not the very first one in line every single time. 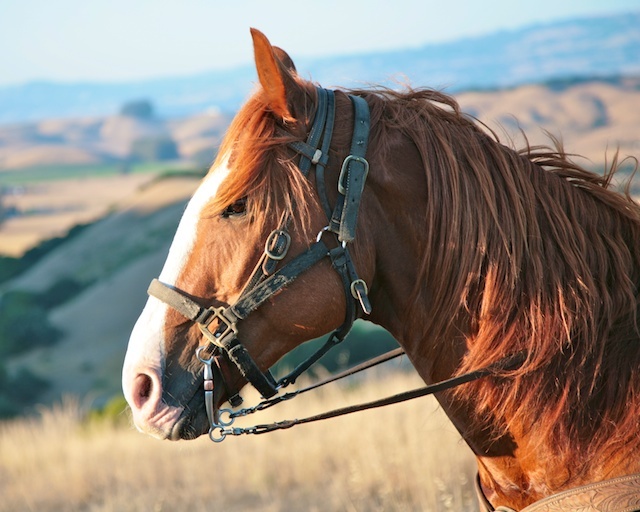 So for now this cutie is a guides-only horse, although we hope he’ll learn from his co-workers who also prefer to lead (we’re looking at you, Newt) that views on the trails at Jack London State Park look good from all perspectives. Our employee-of-the-month feature is a way to introduce and highlight our beloved horses, and Annie, Triple Creek’s choice for April, will likely be in this space a few more times. 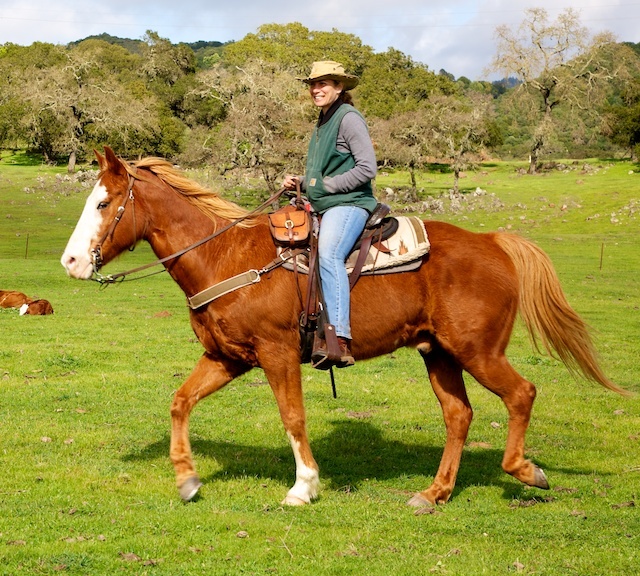 A big, strong and very feminine quarter horse, Annie has graduated from being the guides’ favorite mount to carrying some fortunate guests. She’s sweet natured and very good looking with a sleek seal-brown coat; this picture just doesn’t do her justice. And although humans instinctually equate symmetry with beauty, there’s just something about her off-center, one-nostril snip that is especially endearing and just adds to her allure. 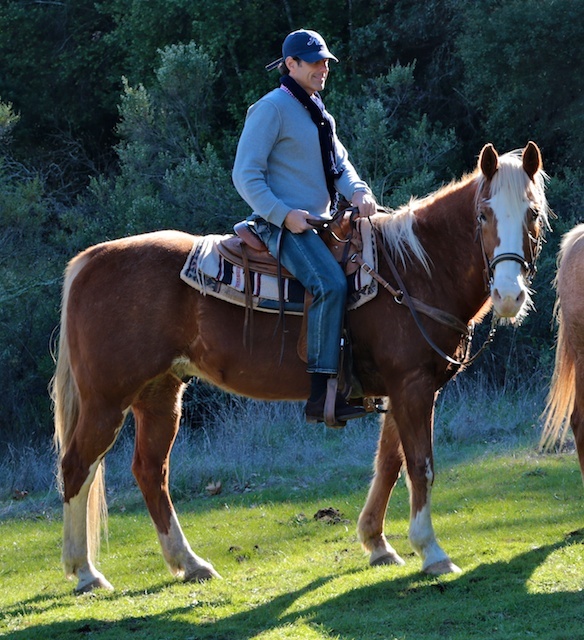 It’s only natural that an outfit in wine country would offer mostly “red” and “white” horses (and at least one “rosé” who pairs well with everything) but Cash, our Employee of the Month for March, is a horse of a different color. A true black (hence the name—the “man in black,” get it? ), Cash stands out in the Triple Creek crowd. Black horses are relatively rare and are considered lucky in many cultures (Indian, Hungarian, Spanish) and have a long history in Hollywood—think Rex the Wonder Horse and Razor, the black quarter horse Lucas McCain rode in The Rifleman and, of course, The Black of The Black Stallion books—so if you’re lucky enough to get Cash to ride you can feel like a hero. Not only is 2014 the Year of the Horse, it marks the 10-year anniversary of Triple Creek Horse Outfit. So we’d like to take this opportunity to thank all our guests and friends, and honor Buddy, our “Employee of the Decade,” even though he is no longer with us. 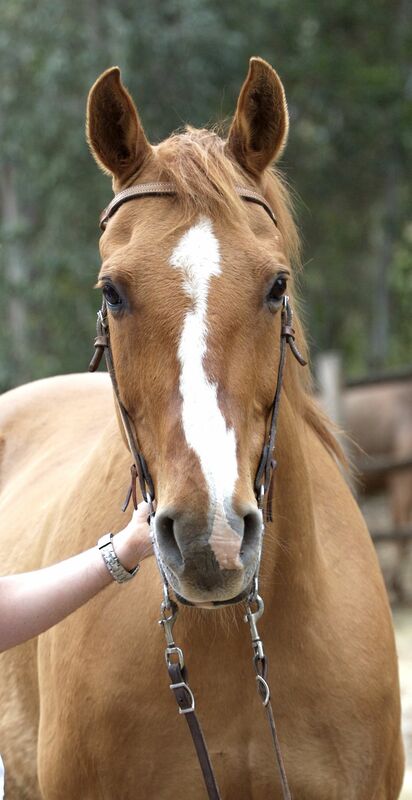 Buddy was a little bay gelding of undetermined origin who started taking riders through Jack London state park in the early 1990s. No horse has taken more riders through that park—he was a steady, unflappable, utterly reliable dude horse who had a long and happy working life and easy retirement. He was also the undisputed leader of the Triple Creek herd, the “Godfather” whose power was both mysterious and absolute. Buddy was the founding steed of Triple Creek Horse Outfit and will always be remembered as one of the best horses ever. The end of this month is the start of the “Year of the Horse” and we can’t think of a better representative than Peanut, the Triple Creek Horse Outfit Employee of the Month for January. 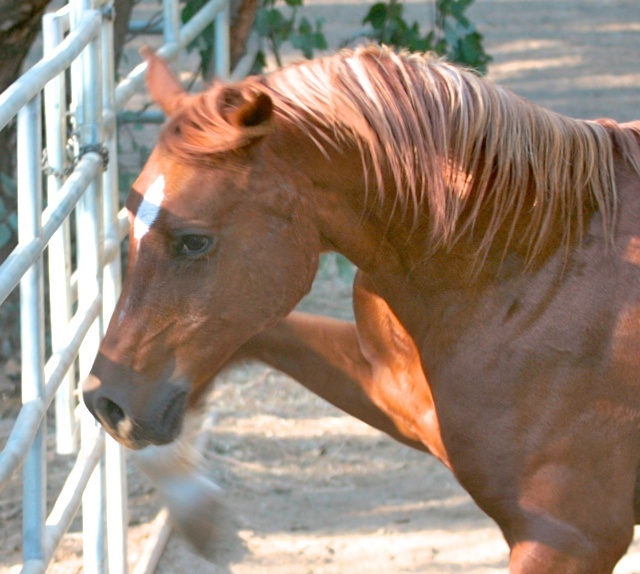 He’s a tough little Arabian with a brilliant copper coat (there’s some *Serafix in his genes, for all you California Arab horse fans) and a light-colored mane. He’s fun to ride because he’s agile and athletic and apparently thinks he is a really big horse. Once you’re off his back Peanut loves a good massage and has been known to follow people around begging for a rubbing. Once Peanut gets what he wants he, naturally, turns to butter. With good horses like Dioko Triple Creek Horse Outfit will “press on” into the New Year. November’s Employee of the Month is familiar to many of our friends, even those who have never been to California. 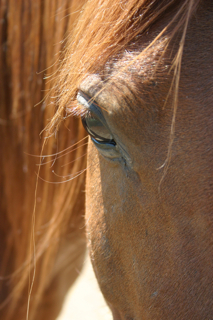 For more than ten years Forrest’s beautiful eye and flowing auburn mane have graced the cover of the Triple Creek Horse Outfit website. Of course, the rest of our saucy redhead is just as striking. 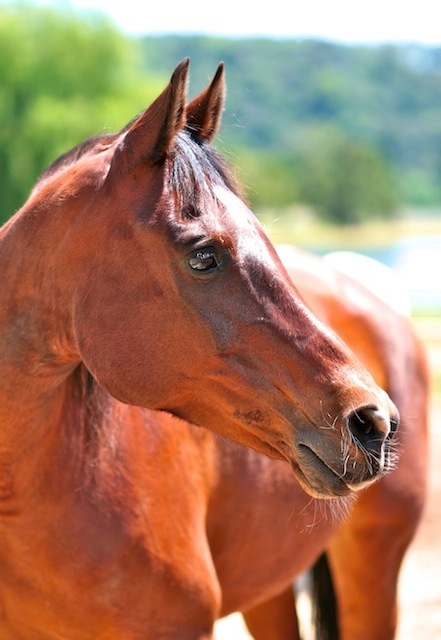 He’s a small Arabian horse with a prominent jibbah (forehead bulge) which apparently holds extra brains, because he’s as smart as he is gorgeous. Here he is supervising the feeding operations, making sure he and his friends get plenty of the really good alfalfa. Triple Creek’s employee of the month for October is a genuine star. Really. Tug makes his movie debut this month at the Mill Valley Film Festival in writer/director Britta Sjogren’s modern-day western, “Redemption Trail,” which has a world premiere on Oct. 6. We can’t wait to see our big guy, playing “Searcher,” in action in the film. Even before the dawn of his acting career we knew Tug was something special; a gentle red horse with a sweet nature and charisma to burn. And now the world will know, too. Every business should have a worker like Triple Creek’s September Employee of the Month. A wily veteran, Smoke has been there, done that, seen it all and still brings a fresh attitude and willingness to the job. Over the years it’s been interesting to see his coat get whiter, although that prompts some to question his name. A smart half-Arabian with a marked talent for undoing knots (then sneaking over to the hay pile for an alfalfa snack), Smoke and his good pal, Diesel, now retired, have taken many a happy rider for a tour of wine country, although they seem to enjoy their winter pasture time together most of all. Years from now that’s the way we’ll probably always remember them. Quiet, assertive, always in control, Deuce, our Employee of the Month for August, is a born leader. Even if he weren’t such a subtle and, at the same time, flashy color—bright dun—he would be a horse to notice. If you’re lucky you’ll get to ride him, but you’re also lucky if you get to ride behind him, where you can appreciate his dorsal mark, faint stripes on the legs and a cute little dimple in his rear. When Erin had to pick one of her herd to ride on the PBS Equitrekking show, she chose Deuce, of course, and it’s still possible to flip on the TV and see Deuce loping through Sugarloaf State Park in reruns. A big Canadian quarter horse, he politely refuses offers of carrots or apples. We don’t know how Deuce got his name but it wouldn’t surprise us if it was because he is just about twice as good as anyone could expect a horse to be. Horses often form strong bonds with each other, but we’ve rarely seen a friendship as enduring as that between Max and Austin, co-Employees of the Month for July. Both mild mannered, gray Arabian horses who met at Triple Creek, they are among the smallest members of the herd and are champs at taking children and lighter people for a ride, so when school is out, they are busy. Max is perhaps the outfit’s most photogenic horse—with his shiny white coat (when he’s clean) and large dark eyes he looks like he should have wings or a swirled horn growing out of his forehead or at the very least that his name should be something like Misty Moonlight Magic. His good buddy Austin, a flea-bitten gray, is a more practical sort who knows that looks aren’t everything—good food, good friends, and a good walk in the park on a fine summer day are what matters. With his long, flowing blonde mane and extra chrome (his wide white blaze), Danny, our employee of the month for June, is a good old cow pony blessed with an exceptionally pretty trim package. Big and strong from the Canadian prairies, he’s also good natured and willing and, we suspect, grateful to now be living in the kinder, gentler climate of the Northern California wine country. Magnum, our handsome bay Arabian and employee of the month for May, gets a little irritated by the phrase “Arab Spring.” As far as he’s concerned, every season is for Arabs and always will be. He may look fine and somewhat delicate but, like most Arabian horses, he’s surprisingly tough and durable. 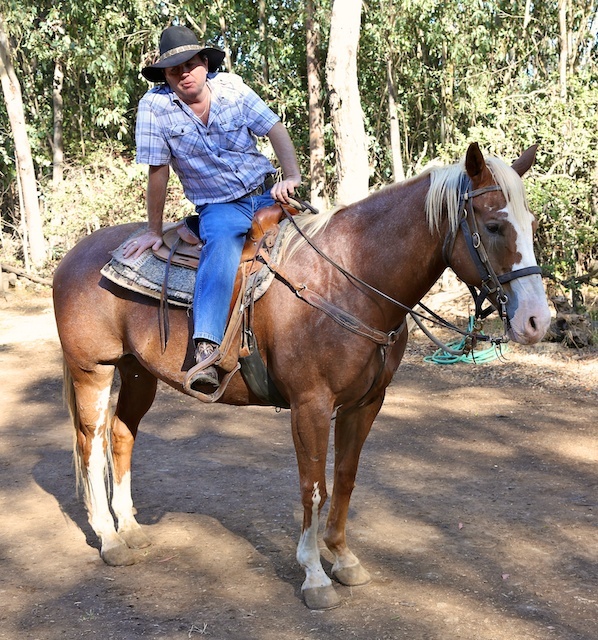 If you’re lucky enough to get him to ride you can tell all your friends you rode a bay horse in the Bay Area while smelling a bay leaf. In late April he was featured in a special travel section of the San Francisco Chronicle doing his best “blue steel” look with ears back, but he isn’t deceiving anyone. Magnum is a big sweetie and we love him to pieces. Jake, Triple Creek Horse Outfit’s employee of the month for April, is nobody’s fool. 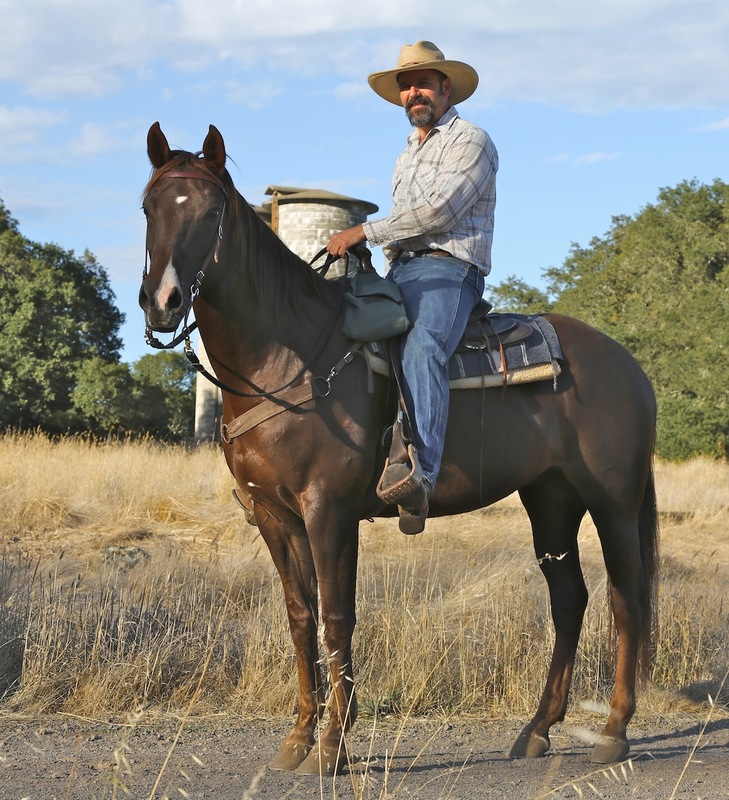 A tall, gorgeous, registered (la de da) quarter horse, Jake is one of the Triple Creek’s original steeds, and he’s taken many a wine country visitor on tours through Jack London State Park as well as Sugarloaf Ridge and Bothe Napa Valley parks. He’s had everyone from small children to experienced riders in his “rodeo queen” saddle, and at least one celebrity, Bill O’Reilly (who was a nice guy, but he kept leaning too far to the right). All the Triple Creek horses respect Jake and all the humans adore him; they don’t come any better than this big, beautiful guy. A real lamb with the heart of a lion, Nevada is one of the “magnificent seven” original horses of Triple Creek Horse Outfit and our March Employee of the Month. The gray mare is an indispensable member of the team and riders from eight-year-olds to experienced wranglers always enjoy an outing with her. This time of year she is snowy white and it’s easy to see how she got her name (“nevada” means snowfall) and soon her copious white fuzz will be brushing out in drifts. Most of the other Triple Creek horses are quite smitten with her, even if she ignores them completely in search of another snack. She’s half Arabian and half Morgan but all business, and “March forth!” may well be her motto. Triple Creek Horse Outfit’s Employee of the Month for February could only be Newt, the strawberry roan, and our special valentine. Who doesn’t love a pink horse with a (sorta) heart-shaped star on his forehead? 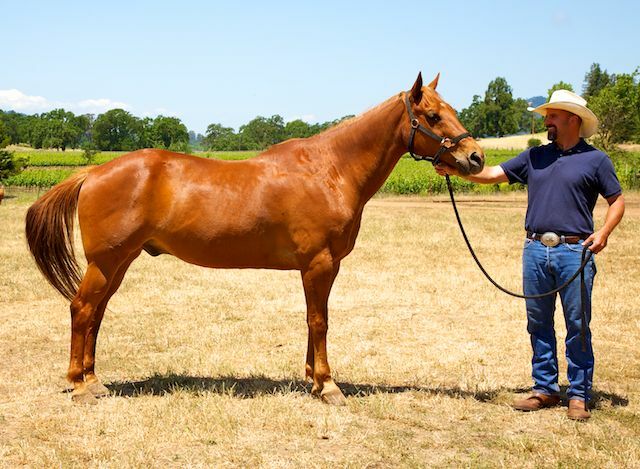 A fast-walking quarter horse who loves treats and belly scratches, Newt is a cow pony who takes an interest in everything and everyone and we just wouldn’t be Triple Creek without him.